FA: Karl Dunn, Peter Gibbs, Rob Sears Jr., Rob Sears, 10/5/68. Vegeneering (as in vegetation/mountaineering) is a term used locally to describe routes like this one. The South Face climbs up the vegetated slabs that start from the bottom of Spry Canyon. Scope the route from the switchbacks leading to the tunnel. The climb generally follows the path of least resistance, up cracks with bushes growing out of them. There are two options to reach the base of the climb. Option one: start on the east side of the tunnel in the upper portion of Pine Creek (not the narrows commonly descended as a cayoneering route but the drainage on the north side of the road). Hike up the drainage for a quarter mile or so. Leave the drainage bottom and hike up the slickrock on the left side of the canyon over a ridge into the next drainage to the south. Keep your eyes open for petroglyphs on the east-facing varnished walls. Drop into Spry Canyon and hike scramble and rappel down the drainage. Towards the lower end of the canyon, it splits. Follow the right-hand fork and work your way up onto the slabs. Option two: park at the Pine Creek Bridge 1.9 miles from the South Entrance. Hike up drainage to the first steep gully drainage on the left. Follow the steep drainage to the base of the East Temple. Look for a vegetated ramp on the east side of the mouth of Spry Canyon. Climb the 4th and easy 5th ramp into the mouth of the canyon. 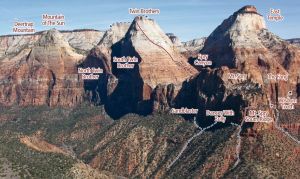 Scramble along the southeast rim of the canyon to a chock stone that makes a bridge across the canyon. Some rope up here. Cross the canyon on exposed terrain and work your way up onto the slabs. Rack: a TOPO MAP, cams 1 ea to 4”, nuts, many long slings for tying off trees and bushes, two 60m ropes helpful. Descent: reverse the route or continue around the horseshoe summit plateau to the top of the North Twin and descend into the slick rock bowl between Mountain of the Sun and Twin Brothers. From the bowl, head into the canyon to the east and hike back to your car. Which SuperTopo guidebooks include a topo for South Face?